A Ligament Injury after a car wreck can be painful and require medical treatment to heal properly. Below is some basic information you should be aware of. A ligament is a band of fibrous tissue that connects bones or cartilages together and serves to support and strengthen joints. The main role of ligaments is to connect bones at movable joints. Without ligaments, the skeleton would simply fall apart. They have a poor blood supply and are therefore not highly proliferate when it comes to regeneration because of their dense tissue nature. Ligaments need to be tough and supportive, but at the same time flexible and pliant, to offer no resistance to normal movements. They are elastic within normal limits and are protected from lengthening excessively by the muscles’ natural contraction. To hold the skeleton together and to stabilize the joints. 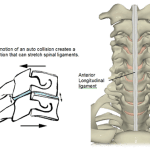 When subjected to trauma such as a car wreck, the ligaments can become permanently stretched. This, in turn, makes the joints unstable. The unstable joints are then subject to pain at the joint and surrounding area. The common cause for injury to a ligament is when the joint is overextended in a direction it is not intended to go, or when it moves further than the ligament allows. Any ligament holding bones or cartilage together at a joint can be twisted, torn, or otherwise damaged by a fall or other injury. A sprain to the ligament is when the dense fiber of that ligament has gone beyond its normal elastic limits. Ligament injuries can range from just local tenderness at the site of injury to a complete tear of one or more ligaments. Often, patients suffering from pain due to ligament laxity will experience relief from adjustments, acupuncture, and physical therapy. But many times, that pain recurs and becomes chronic. These types of injuries are often referred to a soft-tissue injuries. A grade #1 (mild) ligament injury shows no measurable stretching of the ligament, but there is local tenderness at the site of the injury. A grade #2 (moderate) ligament injury has tenderness plus some stretching or a partial tear in the ligament. A grade #3 (severe) ligament injury is a complete tear of the ligament and also joint dislocation. Ligament Injuries are quite common when a person is involved in a car accident, even at low speeds. 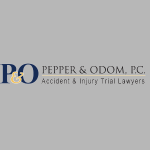 The personal injury Attorneys at Pepper and Odom Law Firm work closely with medical providers to help you get treatment when you’re injured. Whiplash is the general terms people use most to describe similar neck ligament injuries, but ligament injuries can occur at any joint in your body. Call today for a free and confidential initial consultation with one of our accident Attorneys at 601-202-1111 to discuss a ligament injury after a car wreck.